A Southern California town was forced to temporarily ban tourists from visiting a golden poppy "super bloom" after they caused a safety nightmare. Lake Elsinore officials on Sunday closed Walker Canyon, citing a "public safety crisis" as visitors trampled blooms and caused traffic jams. The town of 66,000 saw some 50,000 tourists visit en masse in a weekend. Social media could be behind the incident, which began trending as #poppynightmare, authorities say. After being overwhelmed by the massive influx of visitors on Friday through Sunday in what was described as an "unbearable" weekend, officials briefly shuttered access to the canyon on Sunday night. But by Monday morning, the canyon was re-opened, with officials saying it was "not feasible for us to keep visitors away from Walker Canyon". The rare occurrence, which usually happens once a decade, came after a heavy rain season that has finally freed the state from a seven-year drought. A super bloom occurred in 2017 as well, but a city official described this year's as the largest Lake Elsinore has seen in 30 years. "We've seen much larger crowds this year because the bloom is bigger than ever," Nicole Dailey, Assistant to the Lake Elsinore City Manager, told the BBC. Ms Dailey said Lake Elsinore doesn't normally attract tourists, but media coverage has identified the Walker Canyon trailhead nearby as a prime location to catch a glimpse of the super bloom. "We're getting the crowd numbers Los Angeles gets for large sporting events," Ms Dailey says. "Social media buzz has brought numbers that the city has never gone through before." In addition to travel magazines highlighting Walker Canyon, Instagram has also contributed to the mayhem. Influencers with massive audiences shared photos of themselves in picturesque fields of flowers seemingly untouched by tourists. Lake Elsinore Mayor Steve Manos described it as "insane" in a post on Facebook. "One of our employees was hit and run by a driver. A rattlesnake bit a visitor. Residents have been screaming at the people directing traffic." The city brought in all available staff as well as outside traffic controllers to help control the situation on Saturday, issuing a plea to visitors to visit during the week instead. "People are creating chaos out there and we have already had an injury," officials said on Instagram. "This is a public safety crisis so we ask your support." Over the weekend, residents of Lake Elsinore were faced with up to three hours of traffic on their commutes. Many began expressing their frustrations on social media with the hashtags #Isitoveryet and #HanginthereLE. Next weekend, the weather is forecasted to rain in Lake Elsinore, which could be both good and bad news for the city. 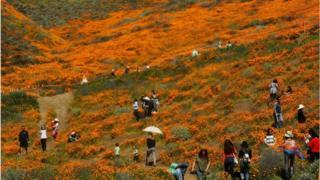 It could deter visitors from coming, but more rain could mean more or prolonged blooms into the next couple of weeks. Either way, Ms Dailey explained: "The city is preparing to reopen the trailhead entrance by providing alternative ways to reduce the impact that the tourism has had on our community."